The Myanmar Tatmadaw delegation led by Commander-in-Chief of Defence Services Senior General Min Aung Hlaing, who attended the 5th Thailand-Myanmar High Level Committee Meeting, left Khon Khan Airport for Bangkok this morning. Before the departure, the Senior General took the salute of the Guard of Honour of the Royal Thai Armed Forces. The Senior General and party were seen off at the airport by Commander of 3rd Army Area Lt. Gen. Vijak Siribunsop and wife and senior officers of the Royal Thai Armed Forces. 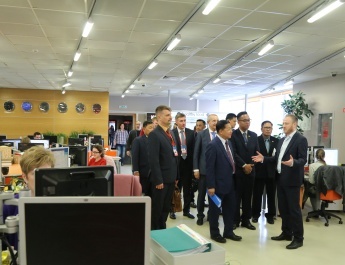 On arrival at Wing 6 of the Royal Thai Air Force at Don Muang International Airport, the delegation was welcomed by Myanmar Ambassador to Thailand U Myo Myint Than and senior officers of the Royal Thai Armed Forces. In the afternoon at the parlour of the Thai Government House, the Senior General met Thai Prime Minister Gen. Prayut Chan-o-Cha. 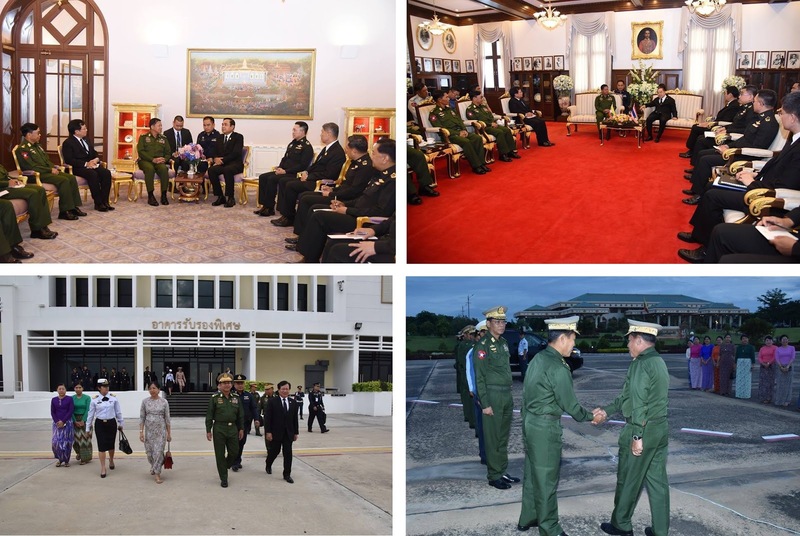 Also present together with the Senior General were Myanmar Ambassador U Myo Myint Than, senior military officers and Myanmar Military Attaché (Army, Navy and Air) Brig-Gen Khin Zaw. 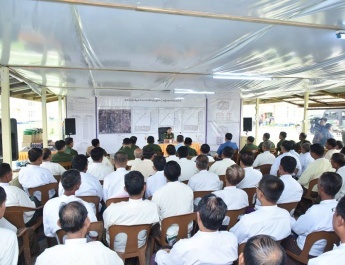 The Thai Prime Minister was accompanied by Chief of Defence Forces of the Royal Thai Armed Forces Gen. Surapong Suwana-adth, Thai government officials and senior officers of the Royal Thai Armed Forces. During the meeting, the Thai Prime Minister said he was glad that the cooperation between the two armed forces could be promoted after successfully holding the 5th Thailand-Myanmar High Level Committee Meeting. He expressed thanks to Myanmar for rendering help in Thailand’s floods. Bilateral trade and investment would increase more than now. The Thai Prime Minister said cooperation will be made also in education, health, agriculture and other sectors. Security cooperation along the border is in good shape. Cooperative efforts will be made to curb human trafficking, gunrunning and drug trafficking. He expressed regret for the losses that occurred in Rakhine region in Myanmar. 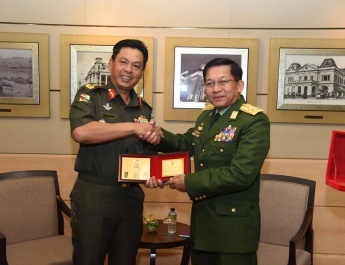 Senior General Min Aung Hlaing said cooperation between the two armed forces of the two countries will be further promoted through the meeting. Cooperative efforts are being made to enforce the rule of law and secure peace and stability of the common border. Investment from Thailand is welcomed. At the time when efforts are being made to restore peace, armed terrorists were murdering administrative staff and innocent people for no reason. Hence the region has seen 81 armed engagements. Fifteen Tatmadaw members, police members and government employees and many innocent people were killed. As the incident has adverse impact on peace, stability and the rule of law of the country, it will be solved through effective means. 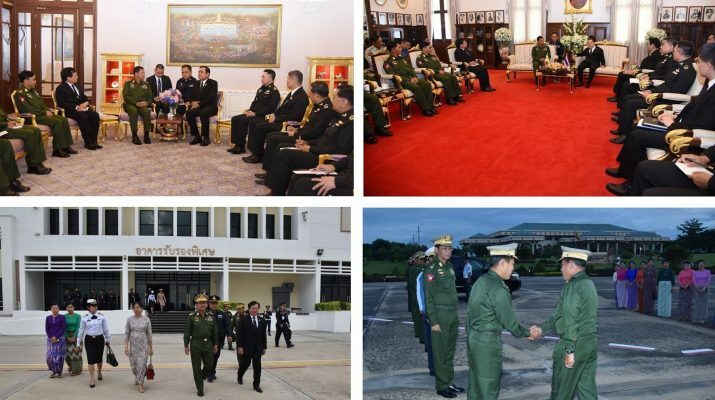 The Senior General called for legal protection and help for Myanmar citizens working in Thailand, promising to strengthen cooperation between the two countries. After the call, the Senior General and the Thai Prime Minister exchanged souvenirs and posed for group documentary photo. Senior General Min Aung Hlaing also met Deputy Prime Minister and Minister of Defence of Thailand Gen. Prawit Wongsuwon at the parlour of the Defence Ministry in the morning, and discussed matters relating to a series of HLC, RBC and TBC meetings that further strengthens friendship. They discussed boundary affairs along the border region, commercial matters, cooperation in solving problems to drug eradication, prevention of illegally holding arms which harms peace processes, and plans to solve problems to terrorism happening at the border of Rakhine State and Bangladesh. He said that Bengalis who are not ethnics in Myanmar entered the nation in the British colonial era. In 1942, Bengalis drove out local Rakhine ethnics in Alethankyaw incident by brutally killing them and took the positions of Rakhine ethnics. As those Bengalis committed similar acts in the present events, the Tatmadaw will not accept and prevent it. 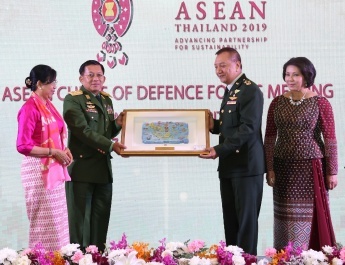 They then exchanged views on prevention of terrorism in the southern part of Thailand and further promotion of relations between the armed forces of the two countries. Then, the Senior General called on President of the Privy Council of Thailand and Senior Politician Gen. Prem Tinsulanonda (Rtd) at his residence in the evening to exchange talks about situations of strengthening relations between the two nations, efforts to end armed conflicts and combat terrorism in Myanmar, and progress in implementation of democracy in conformity with Myanmar. Then, the Senior General and party left Wing 6 of the Royal Thai Air Force at Don Muang International Airport in the evening. They were seen off at the airport by Chief of Military Intelligence of the Royal Thai Armed Forces Lt. Gen Thiwa Penket Gorn and wife, senior officers of the Royal Thai Armed Forces, Myanmar Ambassador to Thailand U Myo Myint Than, Myanmar Military Attaché (Army, Navyand Air) Brig-Gen Khin Zaw and officials. Afterwards, the Senior General and party arrived back at Nay Pyi Taw International Airport where the Senior General and party were welcomed back by Deputy Commander-in-Chief of Defence Services Commander-in-Chief (Army) Vice-Senior General Soe Win, Chief of the General Staff (Army, Navy and Air) General Mya Tun Oo, Commander-in-Chief (Navy) Admiral Tin Aung San, Commander-in-Chief (Air) General Khin Aung Myint, senior military officers and the commander of Nay Pyi Taw Command.